After Josh rolled out the pizza dough into a circle, I stepped in to top the pizza with my delicious toppings. I lightly brushed the dough with olive oil and then added fresh mozzarella slices, peach slices, and chopped basil. Next, I drizzled the pizza with the balsamic reduction. Such a pretty pizza! Place the pizza in a hot oven and bake for about 10-15 minutes. This recipe makes two pizzas. You can assemble the second pizza while the first pizza is baking. If you only want to make one pizza, you can save the other half of the dough for another time. The dough freezes well. We let the pizza cool for a few minutes, sliced it, and started eating. The juicy peaches made a terrific pizza topping. 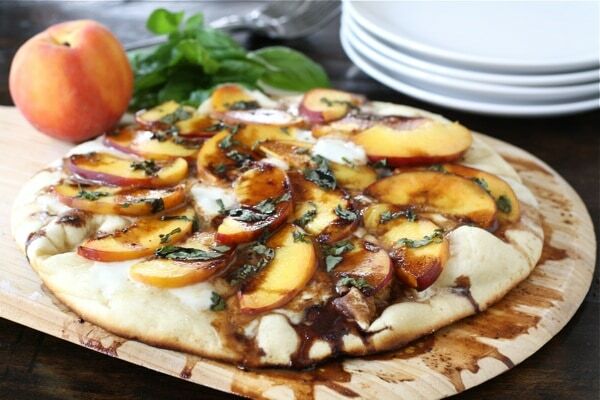 I loved the sweetness the peaches and balsamic reduction added to the pizza. The fresh mozzarella and basil were also divine. The flavor combination was phenomenal! Josh was pleasantly surprised by my pizza creation. We both loved this pizza! 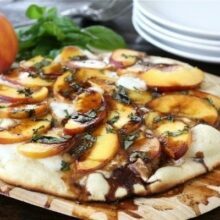 If you are looking for a fun, fresh, and unique pizza-try this Peach, Basil, Mozzarella, & Balsamic Pizza. It is the perfect pizza for summer! 1. In a glass measuring cup or small bowl, combine yeast and 1 cup warm water. Add a pinch of sugar and let sit for 5 minutes. 2. In the bowl of a stand mixer, add semolina flour, all-purpose flour, and salt. Mix the ingredients until combined. 1. While the dough is rising, make the balsamic reduction. Pour balsamic vinegar into a small saucepan, bring to a boil over medium-high heat. Reduce heat to medium-low, and simmer until the vinegar has reduced to 1/4 cup. Set aside, and cool to room temperature. 1. Preheat the oven to 500 degrees F or as high as your oven will go. If you have a pizza stone, place the pizza stone in the oven to get hot. 2. After the dough has risen, cut the dough in half. Take one piece of dough and punch it down on a lightly floured surface. 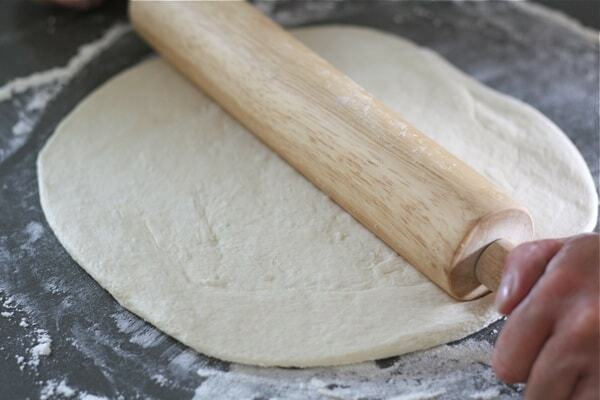 Using a rolling pin, roll the dough out into a circle. Place the pizza on a pizza peel or pan that has been generously coated with corn meal. Lightly brush the dough with 1 tablespoon of olive oil. 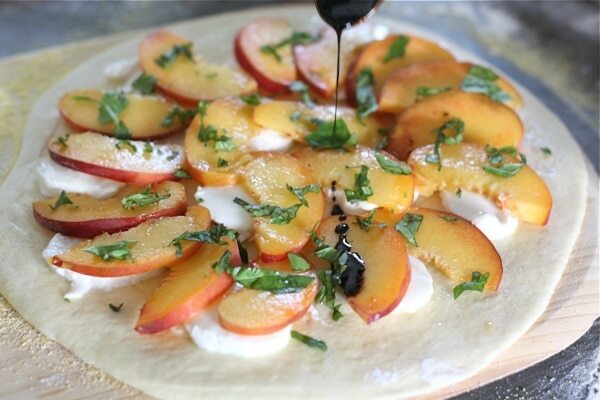 Top the dough with fresh mozzarella rounds, peach slices, and fresh basil. 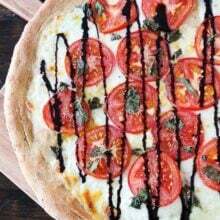 Drizzle the pizza with balsamic reduction. Follow these same steps to make the second pizza. 2. Place the pizza in the oven-directly on the pizza stone, if using one, or on the oven rack. Bake for 10-15 minutes or until pizza crust is golden and cheese is melted. Remove from oven and bake the second pizza. 3. Let the pizza cool for a few minutes and then cut into slices and serve warm. 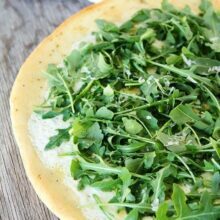 Pingback: Peach, Basil, Mozzarella, & Balsamic Pizza Recipe | Two Peas … at Zapraszamy na pizzę farmerską! SO, so, so pretty! I would dominate this pizza. Maria it looks sooo good! So beautifully photographed, too. Peaches are just divine this time of year! This is so creative! Awesome idea. I love all the flavours you mixed together here! This pizza sounds amazing! 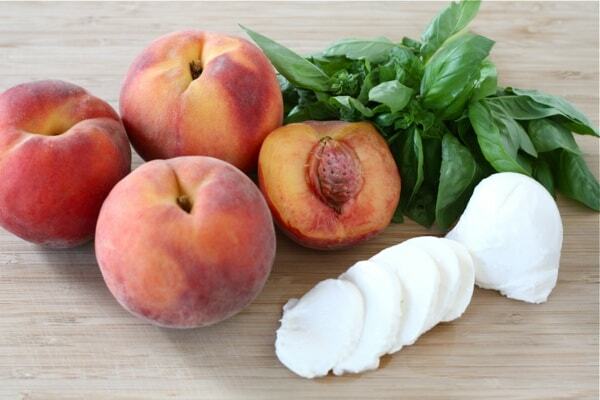 I have had some wonderful peaches this summer and they would be perfect on your pizza! Yes, please! This one’s definitely going in the “to-make, immediately!” pile! what a beautiful pizza…and i love the different flavors! I’ve gotta try this. I’m obsessed with pear slices, gorgonzola cheese, and walnuts on my pizza, this has gotta be just as delicious! Yum! This is the most awesome recipe I’ve seen in a while! Oh yum! You have my heart!! That looks marvelous! So gourmet! I LOVE a good homemade pizza! I havent mastered making dough yet! WOW ! beautiful!! 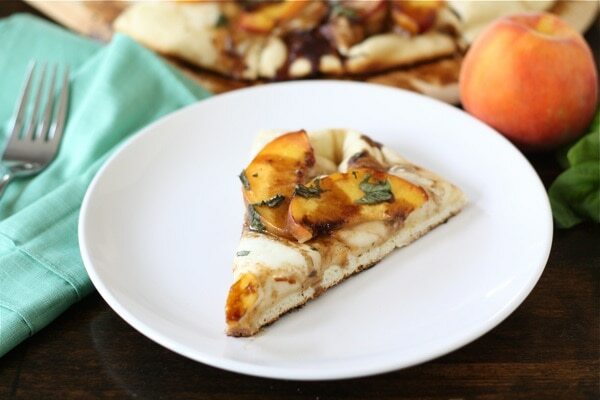 I would have never thought of peaches on pizza!….now my mouth is watering for this! What great teamwork! The pictures are great! Oh. My. Gosh. You are making me drool! Homemade pizza is one of our very favorite things to make together – it’s so fun and SO much better than take out or storebought. This looks perfect with those peaches. Seriously, AND we have everything in stock to make it! Oh my gosh this looks delicious! So beautifully photographed too. Yum! I would SO love this! My husband–probably wouldn’t. But we often make our own pizzas! I’m tempted to try it on a pita for lunch today! I can assure you though, I was not as creative with my peaches as you were with your here on this post! This pizza looks absolutely delicious!!! The perfect summer sweet & savory treat!! This looks ah-mazing and your photos are awesome!! Holy yum is all I have to say! I just got a new bottle of fancy balsamic vinegar and was thinking about pairing it with peaches. This recipe sounds fabulous! I would love to make a pizza like this. The peach and mozzarella sound like a great combination. BUT my husband hates sweet stuff for dinner. Maybe I’ll have to try when he’s not around. This is so different!! I love it. What a great way to use all the sweet peaches available right now. So pretty! Oh my goodness, this looks so good!! I bet goat cheese would be really yummy with the peaches too! Delish. well I KNOW I’m not pregnant but you’ve got me craving this! Definitely making it soon. Looks so tasty! I made one a few weeks ago with peaches, thyme and goat cheese and it was out of this world! It helps that the peaches are so wonderful this time of year. So pretty! And it totally screams summer. This looks incredible. I have never tasted it and already it may be my new favorite pizza! I would have never thought of this combination of flavors but it sounds divine! wow! Great combination! I am trying this one for sure! Any chance you guys deliver? California isn’t too far from you is eat?!?!!! YUM! This looks fantastic Maria! What a cool idea. I bet the mozzarella and peach flavors go so awesome together. Just perfect. I love making homemade pizzas and this one sounds fabulous! Can’t wait to try! 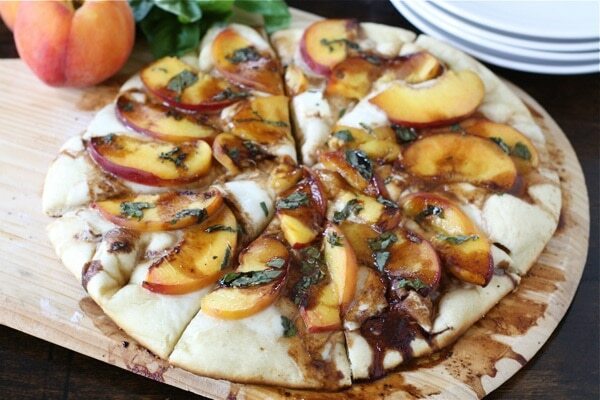 A peach pizza, my son would think it was heaven, I must try this! This looks incredible. I have tons of fresh Washington peaches I have been needing to use up, and anything with balsamic syrup: YUM. I love the use of peach on pizza. Great flavor combination. I’ve never eaten pizza with this combo, it sounds really interesting! Maria, this pizza sounds like a wonderful fresh Summer meal. Love balsamic! perfect for this time of year – LOVE! what a fun and pretty pizza! i love fruit with basil, and balsamic is always welcome in my house. i bet it was delightful! Wow! What a beautiful pizza and what amazing flavors. Looks delicious! Love the peaches too. Le sigh. No peaches where I live. 🙁 And I’m so intrigued. I honestly can’t even imagine this pizza…which makes me want to try it that much more! Looks beautiful! Oh my goodness! What a lovely, sweet idea. Just stunning. You make the most incredible pizzas. What a delicious combo! wow – that looks like the perfect pizza crust! it is now in my “to try” file! pretty flavor combo, Marla! that looks like the perfect pizza crust. so smooth! i am going to put this on my to do list! 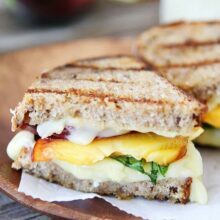 i love the cheese and peach combo! This is so lovely Maria! I bought a box of peaches last week at Costco and was pawning them off on family because I was afraid they would go bad before we could eat them all. I wish I had seen this recipe! I will buy another box next time I am there and give this a try. You have some good pregnancy cravings! This sound phenomenal! 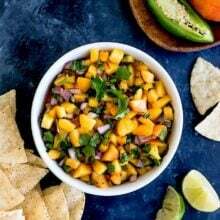 Definitely something i’m going to try out while peaches are in season. This sounds awesome, Maria! I am loving basil this summer – I don’t know how I went so long without having a plant of my own! Like you, I have a TON of it, so this will be a great way to use some of it! I bow down to you. Seriously, this looks like the best pizza ever. I can not wait to try it! Beautiful! Truly, that is one stunning and delicious looking pizza. This pizza looks so interesting. Never would have thought of the idea of using peaches on pizza. Looks like your basil is growing like crazy too! My goodness Maria I am in love with this pizza! Can’t wait to try it! I am positively drooling over this. Perfection! 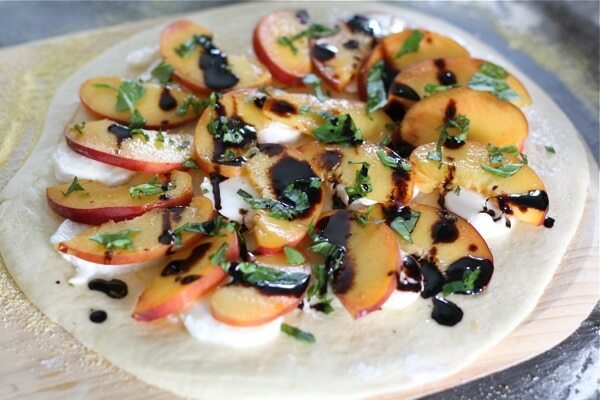 balsamic goes so well with grilled/baked/cooked peaches. i had it once with some sort of cheese, i think it was gouda? I can’t remember, but it was in a dessert. so good, just like this. Beautiful creation….I will make this soon! Thank you! amazing combination! didn’t have time to make pizza dough so made these into quesadillas. delicious!!! i’m going to try this…crazy for it because it combines my two favorite things: peaches and basil. i think i’m going to do it out on the grill and substitute smoked mozarella for the regular stuff…yum. WOW!! I made this for dinner tonight (using a bread machine pizza dough) and it was absolutely delicious!!! The only tip I have it to put a pan underneath the pizza as my balsamic reduction ran off the pizza stone… no worries though, the smoke alarm alerted the family that dinner was ready!! 🙂 Thank you so much for the fabulous recipe! Holy good gravy this looks incredible! I’ll have to convince my man that this is better than the traditional pepperoni … wonder if I can do it despite not being pregnant! What a delicious sounding combination, and a perfect looking pizza dough I must say! I just made this for dinner tonight and it was a huge hit! My husband was really leery of it but he thought it was fabulous. We’re gluten free so I subbed my own GF crust in and added some herbs to it but other than that I followed the recipe. Also I made a nice goat cheese & arugula salad with raspberry vinaigrette that went with it quite nicely. Thanks for the great recipe! You are welcome! Glad you liked the pizza! I’m inviting myself to dinner at your house! this pizza looks amazing. I made this pizza last night. Thank you very much for the idea. I added proscuitto. The slight saltiness created a great balance for the sweetness. That sounds amazing!!! i know i am going to try this. only i think i am going to leave off the mozza and maybe sub in a nut based cheese. This just came out of the oven & I had a slice.. Or four. I cannot explain how delicious this is. The flavor combine beautifully. It’s like a little summer party in your mouth. Absolutely delish. My husband and I made this pizza last night for dinner. We thought the flavors were a really good combination. We already had some pizza dough in the freezer so we used that instead of making your recipe for dough. We didn’t know how big to make the pizzas so we ended up making two roughly 12″ pizzas. If we try it again, we will make smaller pizzas so the dough is thicker. It was too thin and with the juicy peaches and drizzle, it was kinda soggy and therefore hard to pick up and eat (though we don’t mind messy foods at all). We also suggest reducing the balsamic vinegar first because it takes a while. Overall we loved it and this was my first time making anything with balsamic vinegar and fresh mozzarella and I was really excited to try this recipe. Thank you! This was so tasty! I used a premade dough from Whole Foods to make it even easier! I think one could probably get balsamic glaze from Trader Joe’s if they wanted to skip the step of reducing their own (stop the house from smelling like vinegar for the rest of the night ) Thanks for posting something even a lazy cook like me can handle!